A stress fracture is a break in a bone cause by repetitive stress. 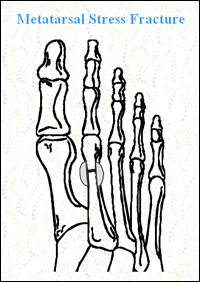 It may occur in any bone, but is quite common in the metatarsal bones of the foot. There is often no recollection of injury. The patient may simply develop a painful forefoot after some activity, such a walking, sports, or stooping down onto the ball of the foot. A small crack develops in the cortex (outer shell) of the bone. Without proper treatment, this may progress to a “through and through” (overt) fracture of the bone.The second and third metatarsals are the most commonly affected. Metatarsal stress fracture may not become apparent on x-rays until a few weeks after the injury. Tenderness to pressure on the top surface of a metatarsal bone. Diffuse swelling of the skin over the forefoot. Ice the top surface of the forefoot for about 20 minuets every hour. To reduce swelling, wrap the foot in a elastic bandage with moderate compression. Wear a shoe with a very stiff sole. Apply orthopedic taping and padding to relieve stress from the metatarsals. Dispense a surgical/ trauma shoe to splint the foot. Prescribe medication for pain and inflammation. Use physical therapy in the later stages of healing. Occasionally a walking cast is necessary.